The experience of being in a room with an entirely too much tuna is one you should really have for yourself. 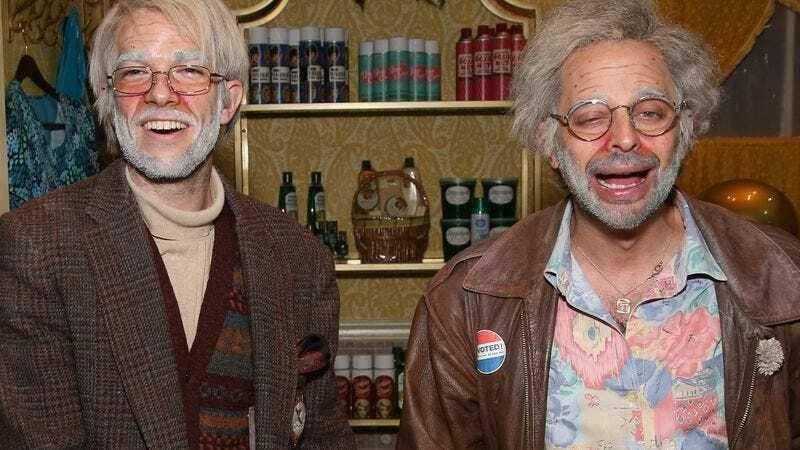 But if you weren’t able to make it to New York to see Nick Kroll and John Mulaney’s Oh, Hello on Broadway, it looks like you’ll be able to witness Gil Faizon and George St. Geegland’s epic pranks in another fashion. According to a press release issued today, the show will be filmed this week so that it can be broadcast at some point. Kroll and Mulaney have appeared as Gil and George on screen plenty of times in the context of Kroll Show, but Oh, Hello captures the full extent of their insanity. More performances may also be on the horizon if a fairly vague statement is to be believed. “While no official touring plans have been announced, Gil and George can confirm they each have a very early doctor’s appointment sometime next week,” the release reads. This all comes as producers reveal that the production was a bona fide success, recouping its investment of $2.9 million. Now, just imagine if all that money was spent on fish salad.